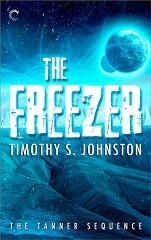 Timothy S. Johnston has done it again with his newest Kyle Tanner book, The Freezer. Once again, the reader is taken on a wild ride where uber-homicide detective has to discover a killer. This time, though, there is a very real time limit. As the first line of the book states, within a few days, Tanner will be dead. A scientist is murdered on Ceres, but the trail leads Tanner to Jupiter’s Europa where a team of scientists are searching in the water under the ice of the moon for signs of life. Taking two of the scientist from Ceres and a civilian engineer whiz, he is confronted with mystery after mystery as he tries to unravel what is really going on at the research station. In The Furnace, we are introduced to Tanner as a gruff, duty-bound detective with a talent of following his gut to a successful arrest. In The Freezer, Tanner’s character becomes more complex and richer. He starts to question the polices of the Confederacy, not to the point of quitting or doing anything about them, but just to acknowledge to himself that the Confederacy might not be a completely benevolent government. There are other characters with a fervent loyalty to the Confederacy as well as characters who are dissidents, but Tanner seems to be straddling the line just a bit. His own sense of duty keeps him performing his mission, but there are cracks just beginning to show in his feelings. The two diametrically opposed facets, lock-step adherence to duty and a personal feeling that simple disagreements with how the Confederacy is run is not a capital crime, are making Tanner more interesting, and are probably a foretelling of things to come in the next book in Tanner’s series, The Void. As before, Johnston has done a lot of research in writing his book. The science is generally accurate and in line with current knowledge. It is not thrown at the reader in an info dump, but rather fed in drips and drabs as the storyline progresses, quite often almost as in an afterthought. On several occasion, I was off to the internet as the science presented got me interested in a deeper understanding of it. The Freezer is a little bit of Asimov’s Caves of Steel , a little bit of Shelley’s Frankenstein, and a bit more of Carpenter’s The Thing, , but it is totally unique in its own right. It is direct and to the point with enough action to please everyone. What might have impressed me most was that Johnston somehow managed to create a sense of foreboding claustrophobia in the wide open reaches of Europa’s ice field. This is a great ride, and I heartily recommend it. For more reviews or to buy The Freezer from Amazon.com, click here.